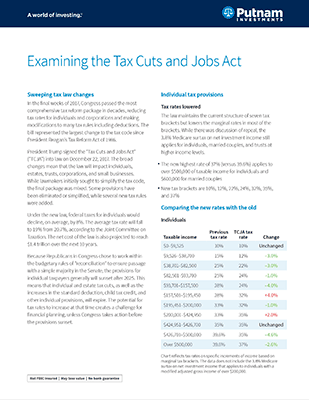 The sweeping tax reform bill recently passed by Congress reduces tax rates for individuals and corporations, and makes multiple modifications to the tax code, including changes to tax rules and deductions. The new law is estimated to reduce federal taxes for individuals by an average of 8%, according to the Joint Committee on Taxation. The average tax rate is projected to fall to 19% from 20.7%. Because Congress used the reconciliation process to pass the bill, the provisions for individual taxpayers generally will sunset after 2025. This means that tax cuts — including the individual and estate tax cuts, as well as increases in the standard deduction, child tax credit, and other provisions — will expire unless Congress takes action before the sunset date. The potential for tax cuts to expire creates a challenge for financial planning. It is critical for investors to understand the new law and how it may affect their current financial plan. It also underscores the importance of seeking expert advice from a financial advisor or tax consultant. The current structure of seven tax brackets remains, but the marginal rates are lowered in most brackets. The new highest rate of 37% applies to those with income over $500,000 for individuals and $600,000 for married couples. Capital gains and qualified dividend income tax rates remain the same. Multiple changes to the tax code affect tax deductions by eliminating or limiting some common deductions. Taxpayers who are accustomed to itemizing deductions may want to revisit their tax filing strategy with an advisor. Standard deductions are being doubled for individuals and married couples. There are new limits on the mortgage interest deduction for mortgages created after December 15, 2017. Interest on home equity lines of credit is no longer deductible. State and local taxes are capped at an aggregate of $10,000. Deductions for medical expenses are being expanded by lowering the threshold of when taxpayers can begin deducting expenses to 7.5% of adjusted gross income. Miscellaneous 2% deductions are eliminated.